Today I share with you a new restaurant opening in the heart of Boynton Beach… Baciami Italiano, (Italian for ‘kiss me’) is an authentic Italian dining destination owned by father and son restaurateur duo Steven Pellegrino, Sr., and Steven Pellegrino, Jr., of Delray Beach’s famed Prime Steak & Seafood and Il Bacio Restaurant & Night Club. Introducing a revolving menu of weekly specials, including daily happy hour (Offering an expansive selection of wines, beers and cocktails), Ladies’ Pie & Wine Night, Family Dinner and Maine Lobster specials. Baciami Italiano is the “new place to be” in Boynton Beach! In addition to these offerings, Baciami features an imported authentic Neapolitan pizza oven to cook pizza in under 3 minutes and a diverse Italian menu orchestrated by classically-trained Chef, Anthony Ianniello – all served up with unparalleled hospitality. There are many ways in which you can enjoy your experience at Baciami Italiano; dine al fresco on their patio or take a seat at their cozy bar or choose to sit in the main dining area which can accommodate party sizes ranging from couples to large family gatherings. The restaurant also offers additional private dining space for groups of 25 – 60 people, including a private dining room with built in audio visual capabilities and a private lounge area for social dining experiences. Left to Right: Roasted Fig Wood Burning Brick Oven Pizza topped with caramelized onions and creamy goat cheese. The Works with meatballs, sausage, baked eggplant, fire roasted sweet peppers & mozzarella; Rabe & Sausage made with sauteed broccoli rabe, roasted garlic, sweet Italian sausage, mushrooms & shaved Romano. This was an adaptation of the Baciami or “Kiss Me” at Sunset cocktail. Not on the regular menu, but available to those in the know. Ask for it at the bar or have your server bring one to you in the main dining room. I substituted the Campari for Prosecco. It’s not only pretty, but it’s delicious! The Cutting Board: an assortment of artisan cheeses, cured meats, candied walnuts & olives. Stuffed mushrooms: sausage, broccoli rabe, sharp provolone. The flavors were absolutely amazing! Meatball Parmigiana: made with Kobe beef, veal, and a small amount of ground pork, brick oven roasted peppers and topped with shaved Romano. Baked eggplant Parmesan. They only bake their eggplant; never fry. Veal Chop Milanese with arugula, baby tomatoes, truffle oil, shaved Romano. Dolce: Anthony’s Tiramisu, Carrot Pecan Cake (for 2), Cannoli, Creme Brule, NY Cheesecake, Chocolate Mousse Cake, Frutti di Bosco (fruit cream tart), Strawberries zabaglione. Strawberries zabaglione. Zabaglione is an Italian dessert, or sometimes a beverage, made with egg yolks, sugar, and a sweet wine. Some people like to add some spirits, such as cognac. The dessert version is a light custard, whipped to incorporate a large amount of air. Adult milkshake made with 1/2 shot of Frangelico, 1/2 shot of Bailey’s, lowfat milk (why bother with the lowfat?!? lol), chocolate syrup, a scoop of chocolate ice cream and fresh whipped cream. Other menu highlights include Grilled Octopus with baby arugula, white beans, potato, Anthony’s Sunday Gravy with meatballs, sausage, braciole, Guiseppe Coco jumbo rigatoni, Chicken Milanese with arugula, baby tomatoes, truffle oil. Guests of Baciami will find a diverse list of imported and domestic wines by the glass and by the bottle to complement their dining selection. Open for lunch, dinner and Happy Hour, Baciami Italiano is located in the Las Ventanas shopping center at 1415 South Federal Highway, Boynton Beach, FL 33435. Hours are 4:30 – 10:30 p.m. Sunday – Thursday and 4:30 p.m. – 1 a.m. Friday – Saturday. For more information, visit www.baciamiitaliano.com or call 561-810-5538. Today’s feature is on Boon’s Asian Bistro in West Delray Beach, FL. (W. Atlantic Avenue and just east of the Turnpike) There is another Boon’s (related) in West Boca on 441, however, this one has a completely different menu. Boon’s Asian Bistro features cuisines from all over Asia, including Japan, China, Thailand and the Philippines. Boon’s embodies Buddha’s philosophy to seek happiness through peaceful harmony with themselves and the environment. In this respect, they strive to provide sustainable, antibiotic & hormone-free food where guests’ complete satisfaction is their mission. They strive to be a place where even the unexpressed wishes or needs of their guests are fulfilled. Their pledge is to provide a dining atmosphere where guests will not only enjoy the highest quality of fresh, locally sourced foods from farms and artisans from around the world but provide a fun, relaxed environment where traditional dining norms are ignored and/or broken. I was recently invited to dine as a guest of the restaurant during their soft opening. My companion and I had the opportunity to sample a nice cross section of the menu. Tuna tartare with Casava Chips. This appetizer was very light and fresh and each component of the dish complemented each other. I especially loved using the Casava chips to scoop up each bite. The Tom Kha Gai soup was outstanding. Full of flavor and mushrooms that have been cooked, as compared to most places that serve this dish with uncooked mushrooms. I believe the cooked mushrooms added another layer of depth and flavor. Lobster roll. Most lobster rolls I have had contain battered & fried lobster inside the roll; this one utilized Maine lobster that had been poached in its shell and was very light. It was a lovely presentation, and I liked it, but it wasn’t a stand out item for me. Tofu Tempura with a peanut dipping sauce. Nice and light. I thought my favorite fish was Chilean Sea Bass until I met this beauty. May I introduce to you North Atlantic Black Cod. Have you ever had this fish? Well, it has now catapulted to first place in the category of my favorite fish dishes, thanks to Boon’s. I especially loved the glaze that coated the fish. Yummo! The filet mignon was cooked to a perfect medium rare. It was wonderful. The fried rice was excellent! I especially liked the grilled pineapple pieces that were included. The Crispy Duck was seasoned and cooked to perfection! This delicious dessert concoction is called the Buddha’s Candy ice cream sundae. It has all kinds of whimsical things thrown in for fun such as cotton candy, marshmallows and pop rocks. Phone: (561) 501-6391 Website (still under construction) www.BoonsAsian.com. While on my trip to Orlando last week, I got invited to participate in an impromptu tasting by my Instagram friend Chef Matt Oakley from Tommy Bahama. It was an honor and I was so excited to meet Chef Matt and taste his food since I began following him on Instagram. I was immediately shown the “Aloha” spirit when I walked through the doors and was greeted warmly by the hostess who proceeded to ask if I was Denise. With a big smile, I answered yes and then was asked to follow her to a table that had been set up for me. After meeting Chef Matt and chatting with him for a bit, he told me that Tommy Bahama and their restaurants serving Island fare have been around since 1993; the first one opened in Naples, FL. Today they can be found spreading the Island cheer all around the globe. This Tommy Bahama happened to be the company’s Research & Development for their restaurants and Chef Matt works closely with their corporate chef to create some of the menu items. (The pork belly and the Peanut Butter Pie below are two of his own creations). Ahi Tuna Taco..Crispy Wonton Taco Shell, Yellowfin Tuna dressed in a mix of Soy Sauce, Sesame Oil, Cilantro, Capers, Ginger, Garlic and a hint of Chipotle Pepper. Topped with Red Bell Pepper, Scallions and a Wasabi Lime Avocado Cream Sauce. Every component of this dish came together to create the perfect bite. It was well thought out and executed. Oh yeah and so cute too! You can find these under their Appetizer section. Chef Matt shared with me that Tommy Bahama is big on sourcing their fish from those who practice sustainability. Today’s tuna that I was served was line caught from Costa Rica. All of their fish is fresh and they never serve anything more than 3 days old. Gotta like that! Macadamia Nut Crusted Goat Cheese…Laura Chenel Chevre coated in toasted Wailea Valley Plantation Macadamia Nuts warmed in Clarified Butter and served with a Papaya Mango Chutney and Soy Glaze paired with Lavash Flatbread. The combination of Macadamia nuts, clarified butter and goat cheese was amazing and the sweetness from the mango salsa truly made my tastebuds get up and do the Happy Dance. This is an awesome appetizer dish! Pork Belly..Duroc Pork Belly braised in Soy Sauce and Brown Sugar. Seared then served on a Brioche Toast, topped with Pickled Vegetables, accompanied by a Sriracha Aioli. I LOVED LOVED this dish. The pork belly was lean, which is a welcome change to the usual fatty pieces served these days. The combination of flavors from the sweet sauce used in the braising of the pork belly to the pickled vegetables placed on top, to the slight heat from the sriracha aioli on the finish, all had their part in creating a really tasty, balanced dish. You’ll be able to find the pork belly in sliders only during their IT (Island Time) Happy Hour, each day from 4-6pm. Yellowfin Tuna Salad.. Brown Chile Crusted Tuna, Kale, Roasted Corn, Quinoa, Toasted Almonds, Avocado, Island Slaw, Field Greens and dressed with a Soy Sesame Vinaigrette. The tuna had a lovely sear on it and was a wonderful accompaniament to this creative version of a field greens salad. Kona Crusted Ribeye..Ribeye Deckle seasoned with a Kona Coffee Rub, the seared in cast iron. Served on a Cauliflower Chive Mash Croquette with White Miso Butter and accompanied by a Horseradish Aioli. Just when I think I’ve had the best bite of the day, Chef Matt goes and screws things up for me by presenting this little beauty. This here is just heaven on a plate. The rib eye was cooked absolutely to perfection and melted like butter in my mouth. I loved his cauliflower mash croquette creation and the horseradish aioli. You can find this Kona Crusted Ribeye entrée on their lunch and dinner menus. And finally…the Peanut Butter Pie..Whipped Peanut Butter, Salted Pretzel Crust, Callebaut Chocolate Ganache, Red Hawaiian Sea Salt and White Chocolate Mousse Whipped Cream. Oh my!!! Chef Matt really hit all the right notes on this one that is for sure. Loved the sweet and salty and creamy and crunchy contrasts that came together in harmony in a single bite. I wish that Tommy Bahama would open a restaurant closer to where I live in Boca Raton, as the closest one to us here in South Florida is in Jupiter. But in the meantime, with future travel plans in the works to Orlando, you can count on my making plenty of stops back here to this one in Pointe Orlando to visit my pal Chef Matt. CURRENT PROMOTION: All Tommy Bahama retail locations with restaurants have implemented a 20% off retail purchases with proof of a sales receipt at the restaurant, valid on the same day. So eat, shop & save all you Tommy Bahama fans. You’re welcome! For other locations, visit Tommy Bahama’s website. On a recent trip to Orlando to further my education in my Wines for Humanity business and to scout out restaurants for our new culinary tours soon to be offered up there, I was invited as a member of the press to dine at Cuba Libre who just so happened to be launching a new menu the night of my arrival into town. Cuba Libre Restaurant & Rum Bar, located in Pointe Orlando on International Drive, announces its new menu, which debuted yesterday May 3rd, featuring 12 brand new classic and contemporary Cuban dinner items by Chef-Partner Guillermo Pernot, inspired by his bi-annual culinary travels to Cuba. The menu overhaul includes creative appetizers, entrees, and hand-crafted cocktails. In celebration of the popular restaurant’s extensive menu release, Cuba Libre is offering a complimentary glass of its signature red or white sangria to any guest dining at the restaurant for dinner between May 3rd and May 10th, with the purchase of an entrée. Guests must mention the free sangria promotion to their server in order to receive the complimentary item. The Cuban restaurant’s new menu features 50-60% new items including several massive meat entrees for two, such as the Crispy Pork Pata, a 48-hour slow-cooked Berkshire pork shank, served with grilled seasonal vegetables and Moros y Cristianos, in a citrus pan reduction; and the Ribeye Jibaro “Doble,” a 32 oz. salmuera-rubbed bone-in rib-eye steak, served with “boniato bravas” and grilled broccolini. Notable dishes in the new “Latin Steaks and Chops” section include the Vacio Steak Argentino, grilled Argentine-cut bavette steak, with Moros y Cristianos and tostones, and Argentinean chimichurri; and the Puerco Cha Cha Cha, three pork favorites in one jumbo cut: a bone-in loin chop with meaty rib and crisp pork belly, with “boniato bravas” and charred herb salsa, and chipotle allioli. A tropical seafood dish, the Pargo Frito, has also been added – crispy whole red snapper, coconut basmati rice and candied cashews, with a sprouts salad and mango red curry sauce. Cuba Libre has also added a number of new appetizers based on traditional Cuban recipes, like the Chicken Croquetas, Crab Guacamole, Albóndigas Cubanas (or Cuban meatballs), and Octopus a la Parrilla. Guests are sure to be impressed with innovative menu items like the Cuban Sandwich Spring Rolls, and a Cuban twist on the current poke trend, Chef Pernot’s Cuban Poke – marinated seasonal fish, compressed watermelon and English cucumbers, pickled seaweed, avocado, white rice and toasted macadamia nuts, with pumpkin seed oil vinaigrette. An effervescent new hand-crafted cocktail, the Second Street 75, made with Macchu Pisco, simple syrup, lemon juice and sparkling wine, makes for the perfect pairing for the new dinner menu. My server on this evening was James who provided me the most attentive and friendly service I have had in a long time. I asked James for some recommendations and he did not hesitate for a moment when he recommended I try the new Crab Guacamole. The plantain chips were phenomenal – so fresh and uniquely shaped, perfect for scooping up the guac. I loved both the sweetness that the grilled golden pineapple provided and the generous chunks of blue crab meat in this dish. This was a winner for sure. Off to a great start. I washed that down with their Classic Mojito made with Pyrat Rum. Next up, I tried the Octopus a la Parilla. I have had octopus many a time, but I had never been served baby octopus apparently…until now. Wow was this ever different and so tasty. The description read truffle, another favorite of mine, but I’m sorry to say that I just didn’t detect the truffle, but I did discover some heat in the smoked potato crema from the Spanish paprika. I liked this dish very much. Another new menu item I got to try was the Cuban Poke. Tonight’s fish was ahi tuna. A couple things I really enjoyed about this dish was how the compressed watermelon both blended in and resembled the tuna in shape and color and also how it complemented all the flavors in this bowl; toasted macadamia nuts, pickled seaweed, white rice, avocado, English cucumbers and pumpkin seed vinaigrette. Well composed dish. As my stomach was beginning to get full, a duo of steaks appeared before me. From the existing menu I tried the Churrasco a la Cubano and from the new menu, the Vacio Steak Argentino. This was a grilled Argentine-cut bavette steak served with chimichurri, tostone and Moros y Cristianos (rice & beans). They were both terrific but I have to say that the Vacio edged out the other one by a slight margin in my book. Cooked to a perfect medium rare, the flavors were incredible. The steak melted like butter in my mouth. De-lish! For dessert, I was presented a lovely tray of minis from which I chose the flan. But before I could dig in, I was presented with this lovely box which to select my eating utensil. This flan was probably the best flan I have ever had. The custard and caramel were just amazing. It was the perfect ending to a perfect meal! I am so excited that I got to try Cuba Libre while in Orlando and am super excited for the opportunity to work with them on some future groups. If you are traveling to the Orlando area, be sure to make this a stop on your culinary adventures. Cuba Libre Restaurant & Rum Bar in Orlando serves dinner daily from 5 p.m. until 11 p.m. Happy Hour is available every day from 5 p.m. until 7 p.m. The bar is open until 2 a.m. on Fridays and Saturdays. For more information, or to make a reservation, please call (407) 226-1600, visit www.cubalibrerestaurant.com, follow them on Twitter (@CubaLibreORL) or Instagram (@CubaLibreRestaurant) and “like” them on Facebook. Saquella Cafe…more than just great coffee, breakfast & lunch! I had the opportunity to attend a blogger event at Saquella recently to be introduced to some new items that are being added to their menu so I can share them with you. 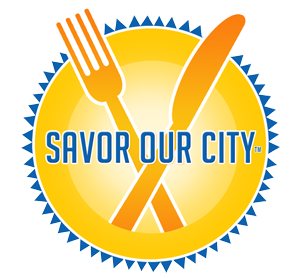 As many of you know, I spend a lot of time in the Downtown Boca area, particularly in Royal Palm Place and Mizner Park where I conduct my culinary tours. Saquella, located in Royal Palm Place, is the go-to-place for friends to gather for coffee and breakfast and a leader in the culinary scene here in Boca since they opened their doors back in 2005. They are recognized as a leader because of their philosophy which has been from the start and continues to be that they are always looking for new ways to innovate and evolve. Saquella has always drawn an International clientele and has become a landmark at the plaza, along with its neighbor across from them, Biergarten Boca. There’s a good chance if you live in Boca or travel to this area that you’ve been to Saquella, but what you many not know is that they are open for dinner and they have a full liquor license. Yep, you heard (well, technically read, correct). Myself and my fellow food bloggers were treated to several dishes prepared by Saquella’s Executive Chef Dave Fogel. To get the night started off, we were each served a Cran Martini. It felt like we were celebrating Thanksgiving for a moment. What a lovely hue of red and what a novel idea of serving fresh cranberries in a cocktail in the Spring. I loved the tartness that the fresh cranberries provided. This martini drank like a Cosmo. I would highly recommend it. The above dishes were not only gorgeous to look at and photograph, but each and every one of them was incredibly flavorful. I enjoyed them all. They all make for great sharing plates. The Shakshuka had melted mozzarella, which is something owner Avi had decided to add and boy are we glad he did. This addition took an already pretty awesome dish and elevated it to the next level Yum! Again, aren’t these plates just gorgeous? The Sunflower seed crusted chicken was cooked to perfection and topped with an Ammoglio, an Italian version of salsa which was drizzled with a garlic confit. The Quinoa Crusted was delicious as was the beet purée found underneath. The short ribs had been cooked for 6 hours which imparted an amazing flavor and were fork tender. The asparagus asiago risotto was cooked to perfection and wonderful! A lovely bottle of Beringer Merlot was poured for this evening’s tasting. Chef Dave did an outstanding job executing our amazing tasting menu. Saquella is open 7 days a week, Mon – Sat 7am – 10pm & Sun 10am – 4pm. They are located in Royal Palm Place, 410 Via De Palmas, Boca Raton. You can visit their website or call (561) 338-8840.